Because of its inovative design, the Hollywood Sport Rider hitch bike rack can easily accommodate children's bikes, adult bikes, downhill bikes, cruiser bikes, full suspension bikes, BMX bikes, "Y" frame designs and much more, without the hassle of removing wheels. 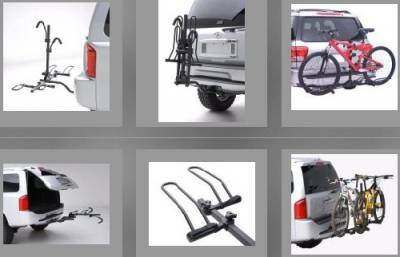 The Hollywood Sport Rider hitch bike rack fits all bikes using a padded universal top clamp and adjustable wheel holders. It is quick and easy to use, and at this price, the Sport Rider rack won't put a big dent in your pocketbook! Simply drop the bike into the wheel holders, then slide the clamp down onto the frame to secure the bike. 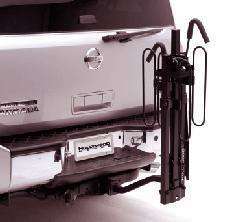 Includes Hollywood racks "No Wobble" threaded hitch pin that prevents rack sway. Fits both 1-1/4" and 2" trailer hitch sizes. -- Carries the widest variety of bike frames in its class. -- Includes "No Wobble" threaded hitch pin to prevent rack sway.